EDINBURG — Walking through the concrete and metal framework of the Bert Ogden Arena construction, RGV Vipers owner Alonzo Cantu stops and points through a stairwell that leads out to the arena floor. As rainfall trickles through the gaps of a building that remains a few months from completion, Cantu leans toward construction superintendents Jaime Garcia and JJ Garza to note a few alterations he’d like made to something on the opposite mezzanine. Cantu Construction has been spearheading the project, which is being funded jointly by Cantu and the city of Edinburg, and Cantu has taken a hands-on approach with the facility. Cantu’s attention to detail and commitment to the quality of the venue are unyielding, even as the adjustments contributed to a delay in the arena opening. After long being expected to host the RGV Vipers for the 2017-18 NBA G League season, the facility is now projected to be complete at some point this spring or summer, Cantu said. 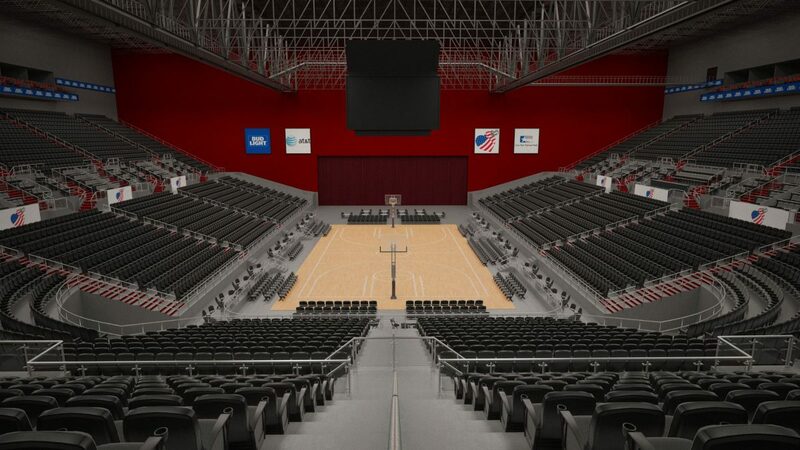 The interior of Bert Ogden Arena is seen in this artist's rendering. The original budget for the project was $60 million when ground broke in February 2015 but has since increased by $28 million to include more space, greater seating and various amenities. At the same time, the project has been delayed by weather and other unforeseen circumstances, but Cantu remains confident the facility will be worth the wait. The arena is projected to seat 9,000 people for concerts in a horseshoe formation, up 1,194 seats from the original four-sided arrangement. For basketball, the arena will seat up to 7,688. 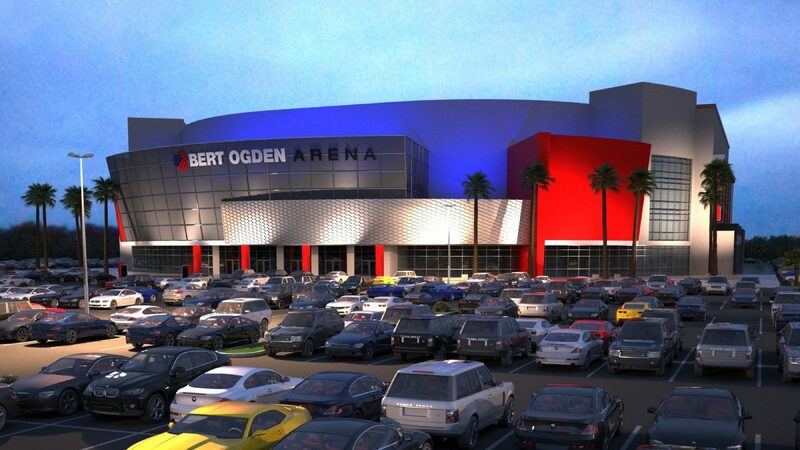 Since the original concept was unveiled, the arena plans have undergone 26 itemized upgrades totaling more than $23 million, according to documents presented to the Edinburg City Council in January 2016. The most significant alteration is the building increasing 63,719 square feet in size at a cost of nearly $15.5 million. The venue also added six luxury suites, one member suite, eight bunker suites and upgraded audio and video systems on top of the already planned 40-by-20-foot video board. The upgrades included finer points like VIP parking, special flooring designs on the main concourse and LED lighting in the parking lot. “I think our arena is going to be just as good, if not better, than anyone in the U.S., and probably the best one for our size and our size community,” Cantu said. Cantu said he honed in on every detail: quartz floors; granite countertops; porcelain in the restrooms; and concrete rather than metal for the stairways. He said each foot of the ceiling and flooring will be finished. He didn’t like the way the seating looked in one of the arena’s private bar areas, so he ordered new furniture. He also prioritized comfort, ordering stadium seats that were 22 inches wide rather than the more standard 18. He said each seating area is 4 feet front to back — more like a movie theater than a typical stadium. Garza, one of the construction superintendents, said the building’s air conditioning units are the largest in South Texas. Even the front of the venue changed, moving from the initial standard, symmetrical design to a tiered elevation that Cantu said offered a more modern feel. Though documentation with the city refers to the tenant as “Vipers Arena LLC,” Cantu lists “major concerts” ahead of basketball when outlining the arena’s purpose. For that reason, the seating arrangement was reconfigured to enable a better view of the stage and a more comfortable backstage area for performers. “I’m not a promoter, and I don’t want to be a promoter, but I do want to do things for the Valley that will change the Valley,” Cantu said. Given the scope of the project and the hope that it will service the region for years to come, Cantu said he never prioritized a firm date of completion. Officials with Cantu Construction documented 90 days lost to rain between September 2015 and the end of 2017. The foundation of the arena included 360 concrete spires dug into the ground, and any rainfall during that stage of construction resulted in a few days of delays to pump water from the holes. Hurricane Harvey delayed the arrival of a crane needed to lift the arena’s pair of 650-ton trusses into position, and Occupational Safety and Health Administration regulations prevent work on the truss or roof when winds exceed certain speeds. Along with the $23 million in improvements to the venue, the project added nearly $5 million in offsite infrastructure improvements, and many of those efforts have also led to delays. The sewer line for the venue was intended to be extended west under Expressway 281 before running into two unexpected blockages. The line has since been redesigned to run east. Gas lines and power poles were relocated, and construction manager Oscar Falcon said the right of way acquisition for Alberta Road, on the southern edge of the construction, “took a little longer” than expected. Negotiations with the Hidalgo County Irrigation District also outlasted projections. Gilbert Enriquez, a member of the Edinburg City Council and the board president of the Edinburg Economic Development Corporation, said he had not been updated on a date of completion, adding that he thought the public was “anxious” to see when the arena will be finished. Representatives from the arena last presented before city council on June 20, 2017, and Cantu said he was unaware a follow-up presentation was desired. After hearing of Enriquez’s comment, Cantu scheduled a presentation to unveil a “critical path” to completion at Tuesday’s city council meeting. Under the original lease agreement, the city was slated to pay $30 million of the $60 million construction budget, with Cantu paying the remainder. When the budget increased to $88 million, Cantu funded the $28 million differential up front, with the city agreeing to reimburse him for $8 million of the $23 million upgrades and all of the nearly $5 million offsite infrastructure improvements. The city will own the arena, but Cantu will have full control of the facility and retain all revenues for the 30-year lease term, paying the city a base rental fee of $350,000 per year. Of that fee, $150,000 is deposited into a capital improvement fund for the arena. Cantu said that money will be used to give the facility a “face-lift” every five years. The city’s portion of the project funds is being generated through a pair of tax increment reinvestment zones.